High quality fundraising products to sell are a tough find. Most of the time, high-end products will come with a high-end price tag. But there are actually options that can provide your donors with nice products at an affordable price. Check out our top five list of some of the best fundraising items to sell. You can make custom t-shirts with creative messaging. Most custom tee shirt companies allow you to choose what kind of shirt to start with. You can choose weight, brand, fit, and other specifications. Hanes “Beefy T’s” have a nice weight and won’t break the bank. When people buy t-shirts, they mainly buy for the design. So if your design appeals to your donor audience, you can make some serious profit. Popular candle manufacturers offer fundraising deals for some of their most popular scents. They’re always a safe bet as gifts for Mother’s Day and Christmas. As a fundraising item, consider the practicality of delivery, especially the weight of a case of candles and the possibility of breakage. Also candle quality varies a lot between companies. When you’re looking for quality, check the candle’s weight, burn time, materials used, and brand name. You may be better off investing in high quality candles than choosing cheaper ones. If you sell low quality candles door-to-door, prospective donors know they can buy a nicer one at the same price at a store nearby. Some of the best popcorn out there comes from fundraisers. You can sell assorted popcorn tins or boxes with unpopped bags. There is a wide variety of popcorn to choose from: caramel, kettle, white chocolate, and the list goes on. You’ll probably be most successful with popcorn if you find a fundraiser that doesn’t use order forms. That way, donors can eat it right away. Having no order forms makes decisions easier for donors, especially for people you don’t already know. Online retailers allow you to personalize mugs with just about anything you can think of...even pictures. Some retailers offer ceramic mugs that are large and break-resistant, but again, think about the logistics of delivering personalized items...to one person at a time. Personalized mugs are a great fundraising item to sell to employees and group members. School teachers love to buy personalized mugs with their school logo and slogan printed on them. There are plenty of cheap options out there, but if you’re selling internally, go with the high quality mugs...they're worth the extra expense (about $12 of upfront cost). World’s Finest Chocolate offers premium products with the perfect unity of high quality and low prices. Our 8-step process starts with cocoa beans from our St. Lucia farm in the Caribbean. We use only the finest ingredients obtainable, and make our chocolate right here in the USA. 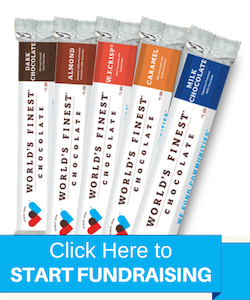 With $1 and $2 chocolate bar options, our chocolate bars are some of the most affordable fundraising items to sell in the market, which is why they sell so fast.. With up to a 50% profit margin for your organization, World’s Finest Chocolate is a no-brainer product choice for a fundraiser. In fact, try out our fundraiser profit calculator! Get in touch with your local rep, or pick up your free fundraising guide. See if you qualify for no upfront costs. We look forward to hearing from you!